On Tuesday, Digital Humanities Awards (DH Awards) announced the winners of its annual award program. These awards are presented to outstanding digital humanities projects from around the globe. Because of the recent announcement, we think it’s perfect timing to showcase DH Awards and its significance within the larger DH community. Now entering its eighth year, DH Awards has gained a large following and functions as a venue to showcase up-and-coming digital scholarship. 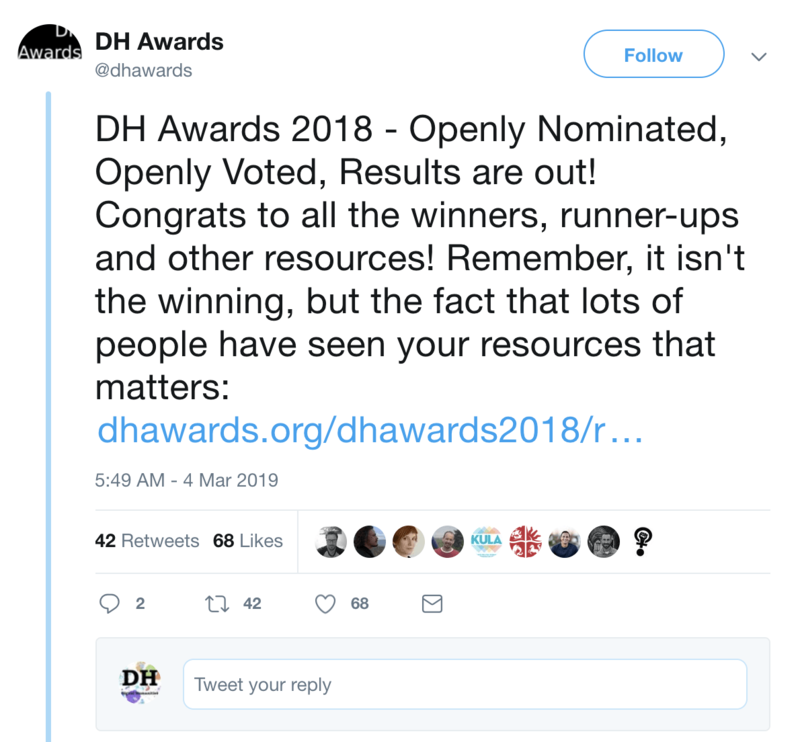 After assigning qualifying nominations to a category, DH Awards opens up the voting process to the public, asking anyone–including but not limited to DH enthusiasts and scholars—to vote on their top choices. 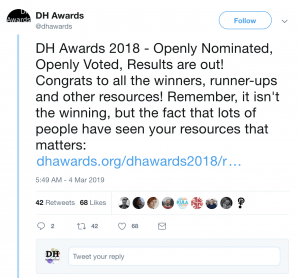 After the two-week open voting period closes in early March, DH Awards announces the top winner in each category on its website, while also listing the runners up and other nominees. All the winners are chosen based on the amount of votes the project received. Winning in any given category does not come with a monetary award, but it does bring increased awareness about each DH project to the broader field. As DH Awards recently stated on Twitter, “Remember, it isn’t the winning, but the fact that lots of people have seen your resources that matters.” For the 2018 awards, for example, 59 projects were accepted at nominees, and 1,539 people submitted ballots for their favorite projects. And even if you didn’t get a chance to vote this year, any visitor to the DH Awards website can follow links to the webpages of all of the winners, runners up, and nominees. Of this year’s winners, we were particularly impressed by PodcastRE, “a searchable, researchable archive of podcasting culture,” which won first place in the category Best Use of DH For Fun. PodcastRe, which stands for Podcast Research, provides a keyword-searchable archive of the Internet’s podcasts, a resource that is crucial for current and future researchers. This site is particularly important because great podcasts can disappear from the Internet as quickly as they arrived. We also enjoyed perusing the British Library’s Digital Scholarship Blog, a fellow DH blog site that is run by the British Library’s digital curators. The blog showcases the Library’s digital collections and won first place in the category Best DH Blog Post or Series of Posts. DH Awards is a great site to visit for those interested in incorporating well-respected DH projects and resources in their courses. We encourage you to visit the site for teaching or scholarly inspiration. One of the most inspiring winners was Quinn Dombrowski’s Toward a Taxonomy of Failure. 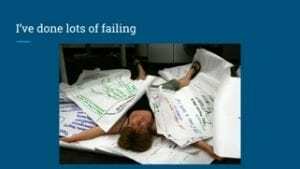 Too often the benefits of failure are minimized in favor of success narratives. 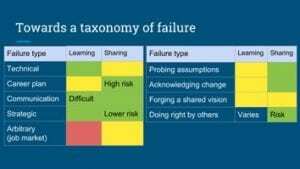 In her talk and blog post, Quinn Dombrowski, author of Drupal for Humanists, and exemplary DH scholar and teacher talks about failure and false failure. This project stood out as a reminder of the stakes of learning something new—such as DH—as well as the identity-based challenges of calling attention to failures, as the related twitter feed makes clear. Do you have a DH project that you want to be nominated? According to the DH Award’s FAQ page, you are more than welcome to nominate your own project or someone else’s. Better yet, nominate a few projects! Likewise, because this is a global award competition, the projects need not be in English. The next nomination process won’t come back around until early 2020, when DH Awards will be taking nominations for 2019. We encourage you to head over the DH Awards website to peruse its past winners and nominees. The website is a fantastic resource for any DH scholar looking for inspiration or a collaborator in our quickly growing field.